Patterned leggings have become quite the fashion statement, with many women seen wearing colourful designs on their legs matched with sweaters, blazers, shirts, wedges and heels. There are many, many brands of leggings to choose from, some more popular than others, which leaves many fashion shoppers questioning which particular line is best. 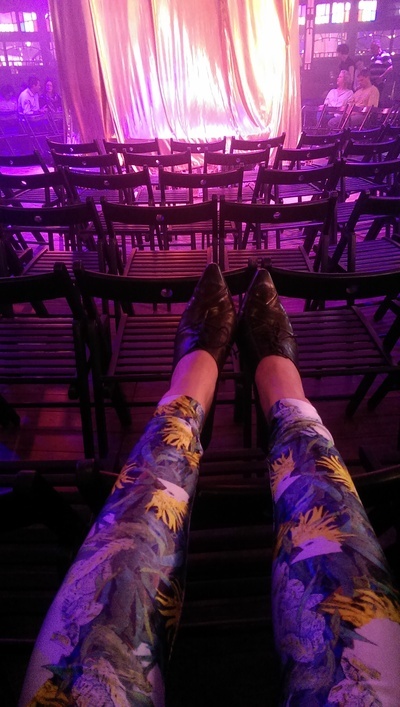 I am relatively new to patterned leggings, but have embraced the trend after receiving a pair of ZOYZ. ZOYZ leggings are far from your average. Not only are they the most comfortable I have had the privilege to wear, but their artistic designs are exquisitely unique. 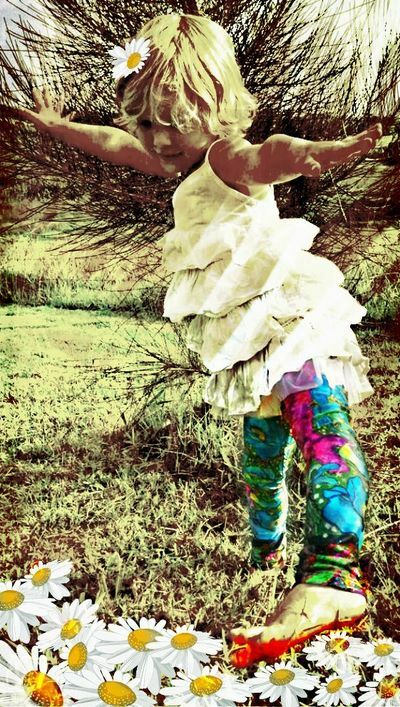 ZOYZ quirky leggings are made with textiles printed with art derived from nature by Surface Artist, Zoya Kraus. Zoya's edgy fabric designs originate from her paintings, delving into the natural beauty of the flora and fauna of the World Heritage listed, Blue Mountains region, where Zoya lives and works. Each one of the five prints comes with its own story based on Zoya's storytelling passions. Not only are Zoya's leggings beautifully unique, they also honour Australian products and services. Here we have an interview with Zoya and her leggings fashion label ZOYZ. 1. Zoya, can you tell me about your background as an artist? Born smack in the middle of Communist Czech Republic, my earliest memories are sitting watching my Babicka (grandmother) bring stories to life as she illustrated traditional Bohemian Folk tales. I remember feelings of fear, warmth and imagination from these stories, and as I grew into my childhood, I took these memories to Australia and began my own adventure with colour. I spent many years playing with artistic practices to feed my creative spirit both in formal training and self learning. I finally chose to define myself as a Surface Artist. I am someone who uses a variety of mediums to express my multi-faceted creativity. Although it seems a completely open-ended Artistic classification, and perhaps somewhat pretentious, it provides me with a platform to express my genre; a limitless artistic expression. I have worked on a vast amount of surfaces both for public sale and private commissions. Apart from traditional canvas, I have painted on canvas and leather shoes, skate decks, fibreglass surfboards, resin jewellery, wall murals, handbags, skin, tattoo designs, laptop and phone skins, homewares, and now textiles. Currently I am working on ZOYZ, my own fashion label; a picture book, soon to be published; a new exhibition, and a very exciting project soon to be publicly announced. ZOYZ was launched in October 2013. 2. How long have you been selling your designs for? ZOYZ was launched in October 2013, and I am currently in my 4th production in as many months. There has been quite a bit of media interest with several "interview" style write-ups. ZOYZ has been sent all over the world, and is gaining in popularity. 3. What made you move into your line of fashion wear? Following a successful, sell out solo exhibition in 2012, I had a lot of people in The “Rag Trade” Industry make contact to orchestrate fashion collaborations. Obviously there was something in my work that screamed print, fashion and design, and decided to venture into it myself. Being new to this practice, I had a lot to learn. I invested heavily into lessons, and found out that the very best way to get my desired prints with replicated colour onto fabric was to digitally print. I had started thinking I could see my work on Lycra both as leggings, and as swimwear - so using high res photos I started playing with repeats of my scanned artworks, and then went on a journey to find the “right” suppliers for me to produce these ideas. Looking for quality, all Australian products and services was paramount to my outcome. Quality control is important to me, and sourcing printers, fabrics, labels, etc has been an expensive but very rewarding experience. I now believe my final product is exactly what I envisioned it to be, and I feel proud that from concept to production, it has only taken me such a short time. A new feature to add is that I am now doing kids sizes from 2yrs through to 10yrs. 4. Where are your leggings produced? 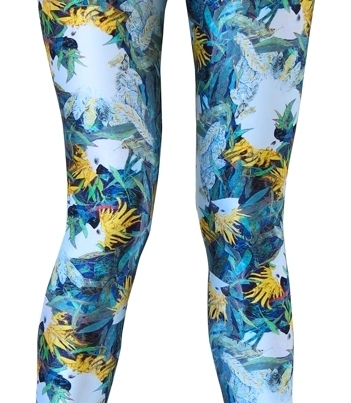 My leggings are completely designed and made in The Blue Mountains, and printed in Sydney, Australia. Every thread, needle, label, fabric, colour and design has been sourced in Australia. 5.Which designs are your best sellers? Hands down the best seller is "Foxy Kinda Night." Coming a close second is "Gathering Gentleman." I cannot keep up with demand of Foxy Kinda Night, and have constant back-orders; people don't mind waiting! 6. Which design is your personal favourite? My two favourites to wear are the Gathering Gentleman and Ewes are Hot. But my favourite print overall is "Bright Sparks" as it has an important meaning to me after the loss of a very close family member, of whom my family and I think of when we see and hear a White Cockatoo. 7.Where can we buy your leggings? And new to the list will be my first retail store Vintage Garage in Collingwood, VIC. 8.Can we expect to see new leggings designs in the future? Yes, I am currently working on my next print designs for release in 2015. I can also exclusively reveal that I will be introducing these current prints in swimwear by summer 2014. Print 5: Ewes are Hot! If you are after a pair of quality Australian made leggings that have a wonderful story behind each design, you can't go wrong with a pair of ZOYZ leggings.